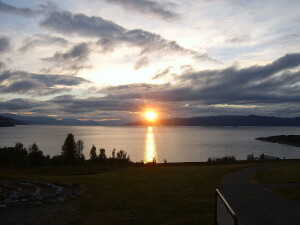 further north above the Arctic Circle, the changing latitude has an even greater influence on the length of the midnight sun. In Barrow, the northernmost city in the United States and Alaska’s largest village, the midnight sun doesn’t set for more than 80 days in the heart of summer. It is a time when local residents shake off the long, dark winter, when there is a corresponding lack of daylight for two months, and work and play outdoors with increased energy. Summer visitors to Barrow will tell you experiencing the magic of the midnight sun is a highlight of their trip.